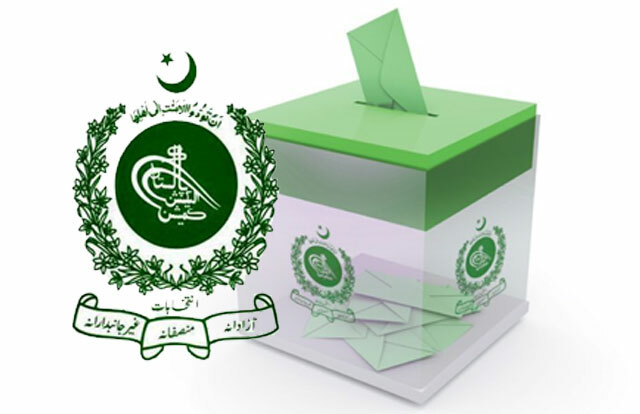 The Election Commission of Pakistan (ECP) on Thursday announced that by-polls on seats vacated by various parliamentarians, who had triumphed in more than one national and/or provincial assemblies’ constituencies on May 11, would be held after Eidul Fitr. By-elections would be conducted on 16 National Assembly and 22 provincial assemblies’ seats. Following general election, all candidates who bag more than one seat in any assembly are required to chose the area they want to represent in their legislature of choice, vacating all other seats, where the ECP will hold elections again. The ECP on Thursday also announced the result on a seat reserved for non-Muslims in the Punjab Assembly and declared Kanji Ram of Pakistan Muslim League-Nawaz (PML-N) as the returning candidate. This seat had fallen vacant due to resignation of Isphanyar M Bhandara, another candidate belonging to the PML-N. Furthermore, the ECP issued a list of parliamentarians who vacated additional seats in the national and provincial assemblies. According to the ECP, Prime Minister Nawaz Sharif vacated his NA-68 Sargodha seat, PTI chief Imran Khan vacated his NA-1 Peshawar and NA-71 Mianwali seats, Punjab Chief Minister (CM) Shahbaz Sharif vacated NA-129 Lahore, PP-161 Lahore and PP-247 Rajanpur seats, JUI-F head Maulana Fazlur Rehman vacated NA-25 DI Khan, NA-27 Laki Marwat seats, Khyber Pakhtukhwa (KP) Chief Minister Pervez Khattak vacated NA-5 Noshehra seat and former KP CM Ameer Haider Hoti vacated the PK-23 Mardan seat. KP Assembly Speaker Asad Qaiser vacated the NA-13 Swabi seat, PTI President Javed Hashmi vacated NA-48 Islamabad, Interior Minister Chaudhry Nisar Khan vacated PP-6 Rawalpindi, Minister for Water and Power Khawaja Asif vacated PP-123 Sialkot, PML-N leader Hamza Shahbaz vacated the PP-142 Lahore seat, PML-Q leader Moonis Elahi vacated PP-118 Mandi Bahauddin while Jamshed Dasti vacated the NA-117 Muzaffargarh seat. The rubbish of democracy!. Why should any one be allowed to contest on more than one seat when he has to soon abdicate it and anew elections held?? Unnecessary nuisance!! Recent election and ECP do not have much regard in Pakistan A group of Old who were not fit to work were given contracts with huge return and they played hell with the voting system and gigging was at its highest and took no notice. Even there is lot of evidence through Camera They still say elections were fair. In what sense. PTI has been cheated with the votes and PML N won by bribing the voters but ex PM Raja Rental lost his money and also election. What a tragedy to Pakistani voting system. Shame on all those who failed in their duties and did not deliver what was expected of them.